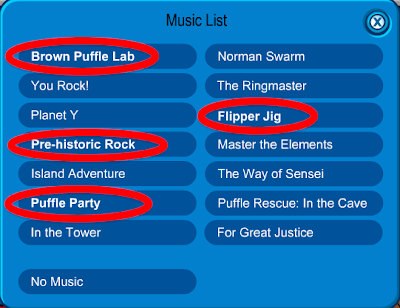 my faviorite is the flipper jig and PUFFLE PARTY!!!!!!!! YAY! 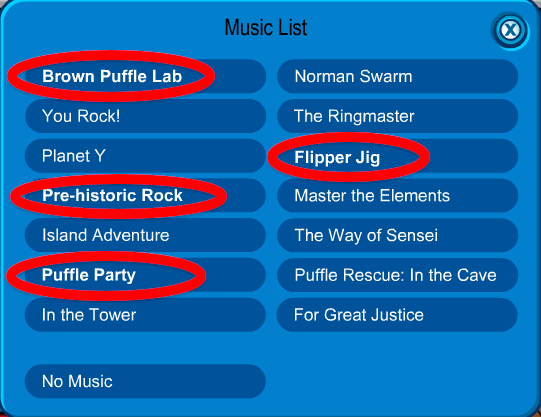 The puffle party music is my favorite one ever!! It just is! The music is kind of boring now. Remember the good ol' classic tunes like hard rock, jazz, beach mix, and all that stuff? Club Penguin Pet Shop Construction! Club Penguin Message from Klutzy! Club Penguin Releases New Magazine Soon! Club Penguin Puffle Food Reviewed By You! Club Penguin Pet Shop and Wigs For EVERYONE News! New Club Penguin Attack Message From Rookie! "The Haunting of the Viking Opera" Cheats! Adopt 20 Club Penguin Puffles! Club Penguin Message From Protobot! Club Penguin Puffles... What's next? Herbert P. Bear Our Buddy? Club Penguin Reviewed By You: Puffle Food! Club Penguin Weekly Field Op Number 33 Cheats! Herbert Left Us A Suprise!? Club Penguin Puffle Party and Brown Puffle! Club Penguin Puffle Party Rooms! Club Penguin Facebook Application for Parents?! Dark Club Penguin Command Room! Final Clue to Mimo's Club Penguin STAMPede Party! Club Penguin Puffle and Pins! New Club Penguin Game Coming! Puffle Launch! Club Penguin Pin Cheat - RED & BLUE PUFFLE PINS! New Club Penguin Director Message! Club Penguin Brown Puffle Glitch Again! Club Penguin Puffle Color Reviewed By You! Club Penguin February Membership Page! Club Penguin Treasure Book 12 Cheats! Club Penguin New Catalog Items! Club Penguin Field Ops 32 Cheats! Herbert Sends EPF Agents Another Message! Book Contest! Win Free Money! Club Penguin Puffle Stories Reviewed By You! Club Penguin February Sneak Peek! Club Penguin February Pay Day!